Squamish Brass Band, ca. 1889. 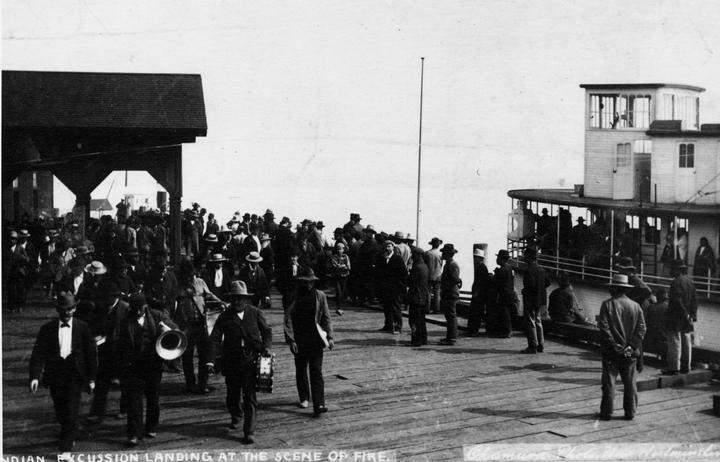 The Squamish brass band quickly developed into a capable ensemble and it was suggested that the band "aid in celebrating the arrival of the first train" in May 1887.2 This, however, did not occur and the Vancouver City Band, itself of no mean reputation, offered musical competition and is known to have performed that day. The Squamish brass band did not play in Vancouver's first Dominion Day parade either, a distinct contrast to the attitude towards the northwest coast Indian brass bands. 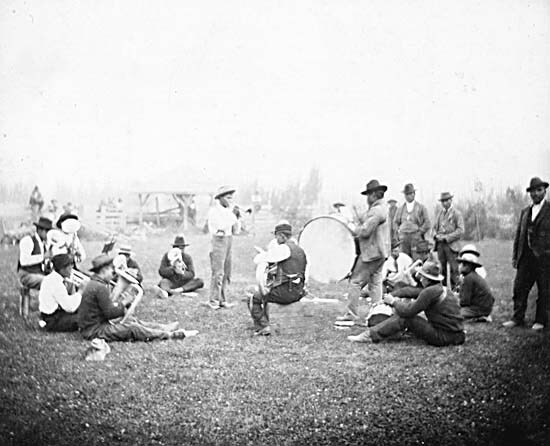 In 1888 the Squamish Brass Band and the Fort Douglas Brass Band participated in the "Corpus Christi" celebration at the North Shore mission. The bands were photographed at this event by C. S. Bailey. Squamish Brass Band rehearsing, ca. 1900. 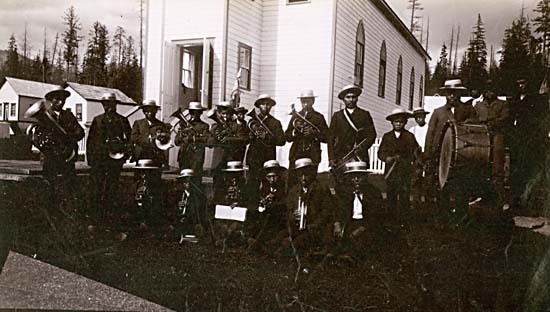 In 1905, the Squamish Brass Band participated in the Dominion Exhibition First Nations Brass Band contest, where they placed second. Like most brass bands in British Columbia, the Squamish Brass Band eventually became a brass and reed concert band. Vancouver News, November 27, 1886, p. 1; and January 7, 1887, p. 4. News-Advertiser (Vancouver), May 22, 1887, p. 4. J. S. Matthews, Early Vancouver, v. 6 (1945), pp. 74-75. Charlton's account is corroborated by articles on the visit in the Evening Herald (Vancouver), September 10 and 12, 1887, p. 4 and 1 respectively. Possibly the Squamish Indian Band, which called at New Westminster on return from hop-picking at Chilliwack. They gave an open-air concert at the corner of Midway and Plaisance, ca. 1898. 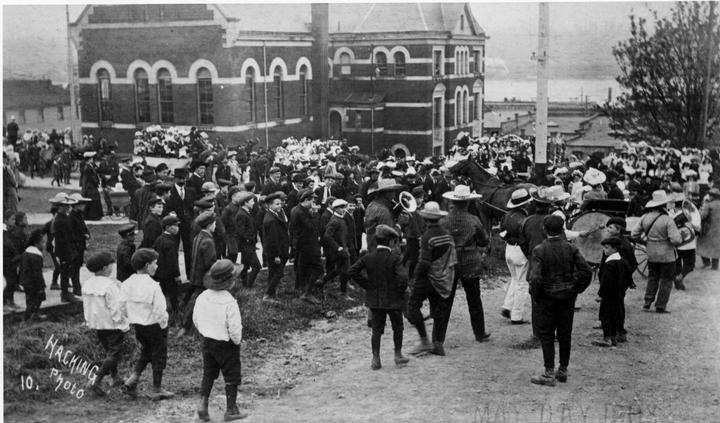 1908 May Day celebrations taking place by the New Westminster Court House. The crowd is gathered for the May Day parade. According to the "Daily Columbian" May 1, 1908. The celebration commenced at 1 o'clock with the assembling of thousands on library square and the departure to Queen's Park. Library Square was just above the Court House, seen in this photo. Members of a brass band, thought to be the Squamish Brass Band, are on the right of the photograph.